Irish sweep the board at Cartoon Forum Tribute Awards with wins for RTÉ, Monster Animation and France-based Irish Distributor Julie Fox. The winners of the 2011 Cartoon Tributes were announced today at the Cartoon Forum in Sopot, Poland and Ireland swept the board, winning in all three categories. RTÉ nabbed the prize for Broadcaster of the Year, beating off competition from France’s M6 Kid, Cartoonito (TBS) (UK/France) and Télévision Suisse Romande (TSR) (Switzerland). The Irish state broadcaster was rewarded for its support and broadcast of animated productions on RTÉ Two and RTÉjr. Monster Animation’s Gerard O’Rourke picked up the prize for Producer of the Year. Recent Monster productions include ‘Fluffy Garden’, ‘Ballybraddan’ and ‘Punky’. ‘Punky’ is the first animated series to ever feature a lead character with Down Syndrome and was recently picked up by Target Entertainment who will sell the groundbreaking series internationally. 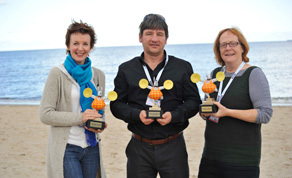 The Irish Managing Director of France-based distributors Awol Animation collected the third prize at the ceremony in Sopot, for Investor/Distributor of the Year. Awol have represented animations from over 120 international clients including Ireland’s Telegael.